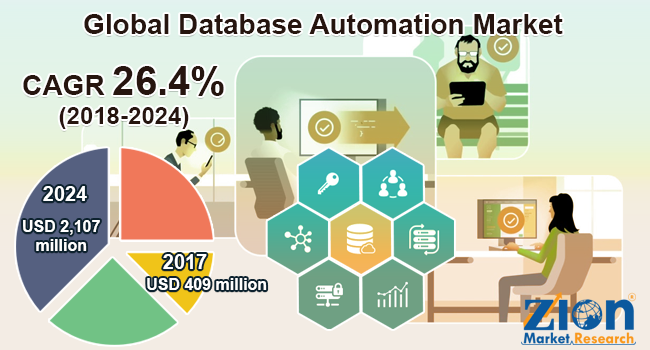 global database automation market expected to reach USD 2,107 million globally by 2024, at a CAGR of around 26.4% between 2018 and 2024. Data automation uses technology and devices to undergo various processes with minimum human interference. Automating databases reduces errors and costs and provides timely services to customers. The report analyzes and forecasts the database automation market on a global and regional level. The study offers past data for 2015, 2016, and 2017 along with a forecast from 2018 to 2024 based on revenue (USD Million). The assessment of database automation market dynamics gives a brief thought about the drivers and restraints for the database automation market along with the impact they have on the demand over the years to come. Additionally, the report also includes the study of opportunities available in the database automation market on a global level. The report gives a transparent view of the database automation market. We have included a detailed competitive scenario and portfolio of leading vendors operating in database automation market. To understand the competitive landscape in the database automation market, an analysis of Porter’s Five Forces model for the database automation market has also been included. The study encompasses a market attractiveness analysis, wherein database, deployment, component, application, end-use industry, and regional segments are benchmarked based on their market size, growth rate, and general attractiveness. The study provides a crucial view of the database automation by segmenting the market based on database, deployment, component, application, end-use industry, and region. All the segments of database automation market have been analyzed based on present and future trends and the market is estimated from 2018 to 2024. By database, the database automation market is segmented into hierarchical databases, network databases, relational databases, and object-oriented databases. Cloud, on-premises, and hybrid form the deployment segment of this market. Solutions and service comprise the component segment of the database automation market. By application, the global database automation market is segmented into finance, operations, human resources, sales and marketing, and information technology. By end-use industry, the global database automation market is divided into transportation, automotive, IT & telecom, retail, government sector, BFSI, and others. The regional segmentation comprises the current and forecast demand for the Middle East and Africa, North America, Asia Pacific, Latin America, and Europe for database automation market with the regions further divided into major countries, such as the U.S., Canada, Mexico, UK, France, Germany, Russia, China, Japan, South Korea, India, Taiwan, Brazil, Argentina, Saudi Arabia, and UAE. The competitive profiling of key players of database automation market includes company and financial overview, business strategies adopted by them, their recent developments, and products offered by them that can help in assessing the market competition. Certain major players operating in the global database automation market are Oracle Corporation, BMC Software, Inc., CA Technologies, Micro Focus, Amazon Web Services, Inc., SAP SE, Microsoft Corporation, Datavail, IBM Corporation, Quest Software Inc., IDERA, Inc., Help Systems, LLC, Red Gate Software Ltd., WhereScape Software Ltd., and Datical, among others.